Apparently this year I have been hooked to series more than I thought and, therefore, I will write the second review this year. I know it doesn’t seem like much, but as I have repeated hundreds of times, I prefer to sit down and read than to dedicate myself to watch series. 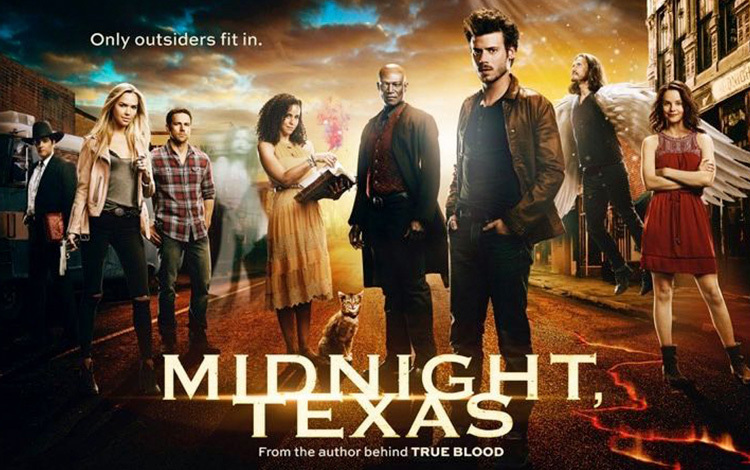 This time I’m going to talk about Midnight, Texas. It’s a paranormal series that premiered last summer, that is, I’ve seen it at the perfect time to not have to wait too long to see the second season, which if I’m not mistaken comes out this fall. The series is based on a book series with the same name from the writer Charlaine Harris, who also authored the books on which True Blood was based. The story centres on Manfred, a medium who follows the advice of his dead grandmother and moves to Midnight, a town in which all kinds of supernatural beings live in peace and harmony with humans. But not everything goes as he thought, a crack to hell is opening in the town and he is the one chosen to close it. I love the characters, almost everyone, especially Fiji (what you expected, she is a witch); and the story is very well conducted and thought through. However, there is something that urgently needs a strong improvement, the special effects. Now I just have to wait patiently for the second season to start!